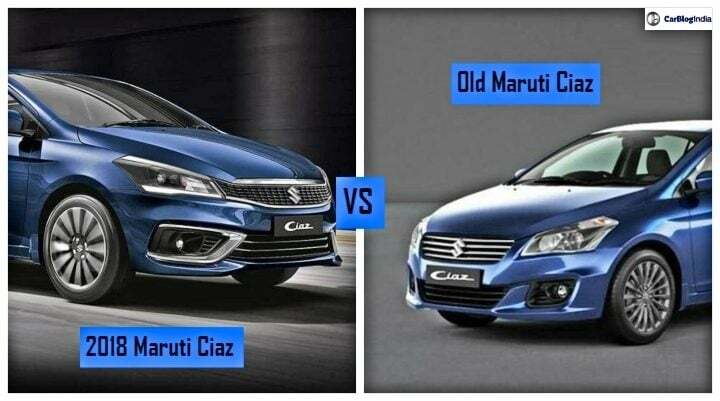 Maruti Ciaz 2018 Vs Old Ciaz -What’s The Difference? The Maruti Ciaz 2018 has been launched in India at a price starting from Rs 8.19 Lakhs (ex-showroom Delhi). The facelift gets a new petrol engine, new features, and minor cosmetic changes. So for that, we have compared it with the old Ciaz to see what has improved from the past. Check out the Maruti Ciaz 2018 Vs Old Ciaz. On 20th August, the facelift of the Maruti Suzuki Ciaz was launched in the Indian markets. It is priced starting from Rs 8.19 Lakhs and goes up to Rs 11.97 Lakhs (ex-showroom Delhi). The facelift gets new features, some design changes, and an all-new 1.5 Litre K15B petrol engine. Earlier, it used the 1.4 Litre petrol engine. Ciaz is one of the most popular cars in its segment, which comprises of Hyundai Verna, Honda City, and Toyota Yaris. At this price, it is not much costlier than the earlier Ciaz. The pre-facelift model was priced from Rs 7.83 Lakhs up to Rs 11.51 Lakhs. Despite having some of the latest features, it misses out on features like Electronic Sunroof, Ventilated Seats and more. So without any further ado, let’s start off with Maruti Ciaz 2018 Vs Old Ciaz. As it is a facelift, it gets some cosmetic upgrades. The changes are not major but can be noticed easily. The front bumper gets a revised design. A reworked design can be seen on the front grille and fog lamp housing bracket. The headlight structure will be the same but might get new LED lightings. It also gets a new set of alloy wheels. The rear portion of the body remains identical, but it can also get some LED treatment. The interiors are almost the same for the Maruti Ciaz 2018. The seat fabric is new and also there are some wood or silver ascents over the dashboard. Rest of the dashboard and the dual-tone color combo remains the same. The new Maruti Ciaz 2018 features a new 1.5 Litre K15B petrol engine. Earlier, it used the 1.4 Litre K-Series petrol engine. The new motor dolls out power worth of 104 BHP and 138 Nm of torque. However, it still continues with its tried and tested 1.3 Litre DDiS diesel engine. The diesel engine churns out 88 BHP of power and 200 Nm of torque. The petrol engine gets an option of 5-speed manual and Automatic transmission. The diesel one gets only a 6-speed Manual transmission. The mileage estimated for the new petrol engine is around 18 KMPL and the diesel one gives out around 24 KMPL on road. Lastly, we come to the price difference between the both. The price difference between both the models is around Rs 30,000 to Rs 40,000. The earlier model started from Rs 7.83 Lakhs and went up to Rs 11.51 Lakhs. The latest one is priced starting from Rs 81.9 Lakhs and goes up to Rs 11.97 Lakhs (ex-showroom Delhi).